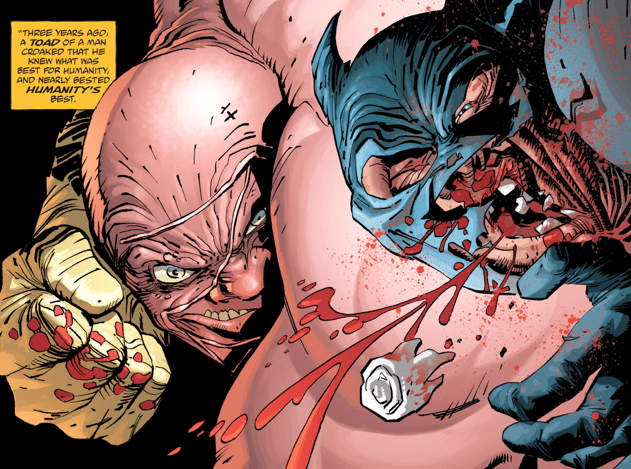 Two issues into the third installment of the Dark Knight franchise and we have a certain amount of questions that never seemed to plague a Frank Miller story. Master Race #1 was an invigorating and kinetic return to Frank Miller’s dystopic Gotham but it didn’t come without its speed bumps. Frank Miller’s writing has always been fast paced and intense, the man could pump out a meaningful story in ten pages if he wanted to. 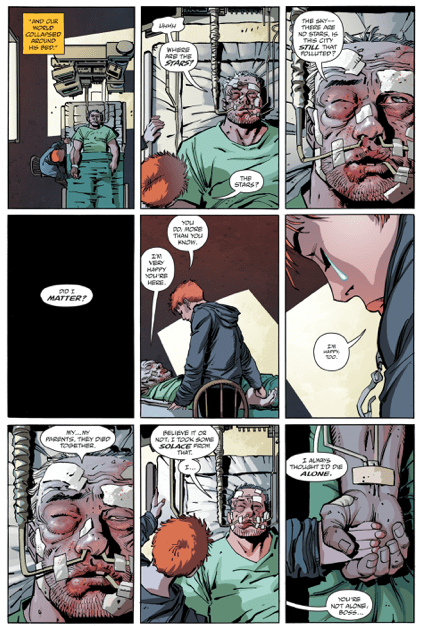 But with the additions of writer Brian Azarello and artist Andy Kubert, Master Race strays from that beaten path and offers the readers a new pace, one more on the lean side, one that makes them yearn for more. At this point we still don’t know who the main character of this series is. Carrie Kelly is currently incarcerated after her stint as the Caped Crusader, Bruce Wayne is seemingly alive but nowhere to be found, Lara, daughter of Superman and Wonder Woman, is dealing with family issues and The Atom Ray Palmer has apparently blown the lid off of a pandora’s box. There is a lot of threads going on here but the potential is there for them to intertwine and evolve into something fantastic. Two main points to take away from this issue; Commissioner Yindel better start taking Carrie Kelly and her “crusade” seriously and it now looks like we know just who this “Master Race” is shaping out to be. Picking up where we left off from the first issue we are watchers of Carrie Kelly’s consequence for donning the cowl and picking a fight with Gotham’s finest. After almost a month incarcerated Yindel gets Carrie to tell her story about the final years of Bruce Wayne and how close they grew in that time. It’s a melodramatic tale of Carrie clinging to a father figure who debates whether or not he made a difference in the world. The conversation with Carrie and Yindel and Carrie’s inevitable escape from the the police were the high points for me. In those moments we saw the characters’ dilemmas exposed and their respective motivations for doing what they do. Another highlight of this issue was the reveal of the Master Race. As soon as the Kandorians were introduced in the story it wasn’t so hard to imagine they could in fact play the titular role and this issue all but confirmed it. 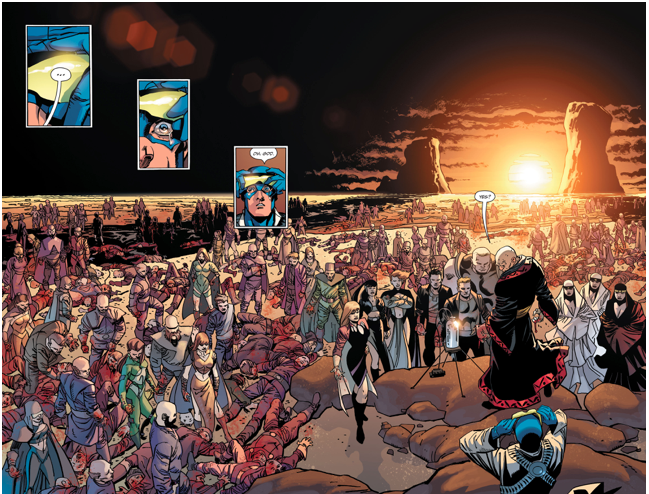 As a fan of Ray Palmer my heart broke as he realized his monumental mistake and with his final words being “I can fix this” right before he was seemingly squished to death was unnerving to say the least. That splash page of the Kandorians reveal was skillfully done by Kubert and is a testament to his work. I am a little torn on the Lara substory. It seems like the writers are trying to do a lot with this character as she deals with a little bit of an identity crisis. Lara is trying to discover who she is, which is a process that to her may culminate in picking a side. She is very much her mother’s daughter, a proud Amazon, but she is identifying herself as a Kryptonian in the last page. It seems a little dragged on at this point but that’s something that could immediately change in the coming issues, stay tuned for that. Finally, not trying to nit pick here but Batman’s face in this panel looks like an accordion. Dark Knight 3: The Master Race #2 is a well-balanced story that does a fine job of balancing three stories involving characters we are learning more about. What is going to happen now that the Master Race has revealed themselves and our heroes are up in the air. In this issue we may have gotten more Brian Azarello than Miller but this is a Miller story through and through, two issues in and both have been quite enjoyable.